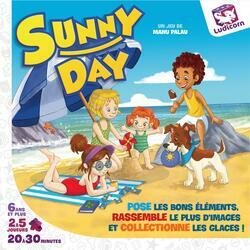 In Sunny Day, earn extra tiles by matching the drawings of the tile you are laying. A simple but clever game that appeals to both young people and adults. Try to complete as many pictures as possible. The more images you assemble, the more tiles you collect. You can even earn bonus points by completing suns and ice creams. But beware ! You will only be able to keep the tiles that connect with the tiles you have already picked up! The game stops when the deck and the players' hand are empty. Your final score depends on the number of tiles you have collected, the number of complete images and bonus points given by suns and ice.